Want to make sure your newborn baby's jaundice-free? There's an app for that! 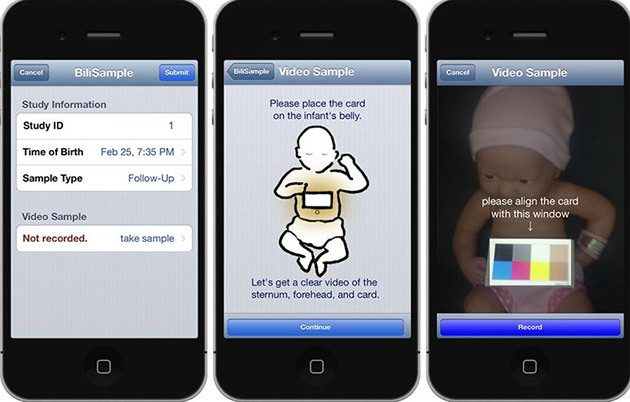 A team of researchers from the University of Washington have developed an app that can diagnose jaundice among infants just by taking their pictures. Since the condition's typically diagnosed by the excessive yellowing of one's skin, it's not too odd to develop a tool that can detect it with just a snapshot, just like that app that can spot skin cancer through a smartphone. You simply place a color calibration card (which helps the software determine lighting and flash conditions, as well as account for the baby's skintone) on the baby's tummy, take a picture and then upload it to the cloud for analysis. The algorithm quickly does its job, and you get the results and the baby's bilirubin levels almost instantly. Bilirubin's the yellowish byproduct of red blood cell breakdown that's usually processed by the liver. Since newborns' livers don't function like adults', over 60 percent of infants experience elevated levels of bilirubin, or in other words, jaundice. While some babies can rid of the excess bilirubin themselves, others need treatment and medication, as jaundice left untreated for a long time could be lead to brain damage or to a serious disease called kernicterus. Although blood tests are still more accurate, the team's goal it to replace other types of screening techniques with their diagnostic tool, and to make it work on babies of every ethnicity. Before that happens, though, they still have to test it on 1,000 infants, especially those with darker skins -- and hope that it gets FDA clearance in the future.